Product quality doesn’t start on the manufacturing floor, and it doesn’t end when a product is shipped, either. 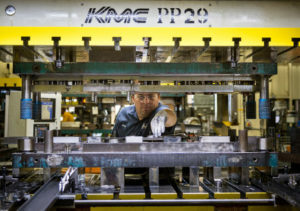 Quality is a philosophy, a standard we at KMC hold ourselves to from the minute a new employee starts their first day to long after a part helps a vehicle run. It’s the only way we will achieve our goal to deliver 100 percent defect-free products to our customers. There are three critical, interdependent factors when it comes to quality control: people, equipment, and parts. Over the years we have analyzed, overhauled, and continuously improved these key areas because our manufacturing partners shouldn’t expect anything less. Following are the insights we’ve gained from the journey. People are the lifeline to any manufacturing company – even in these times of ever-increasing machine automation. Most new hires in the metal stamping industry have general manufacturing experience and need a proper training program to better introduce them to lab and product equipment.